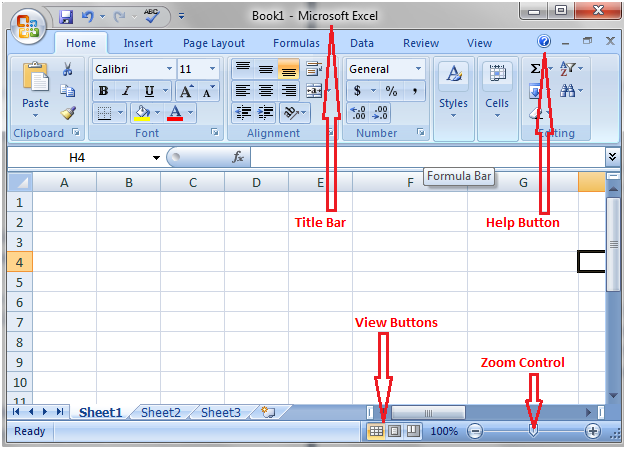 It lies next to the quick access toolbar or on top of the excel window. It displays the name of the open document. It lies on top right corner of the excel window beside the option to minimize the window. It is in the form of an encircled question mark. It provides excel related help. Zoom control is a slider that lies next to view buttons at the right end of the status bar. It helps zoom in and zoom out the document. Move the slider to right or click on the plus sign to zoom in and move it to left or click on the minus sign to zoom out. There are three view buttons on the right end of the status bar, to the left of the zoom control. These buttons provide different options to view the document.